A streamlined IT infrastructure can be the key to success for quickly growing remote/branch offices and small- and medium-sized businesses. All too often, however, IT systems in these office environments comprise an unwieldy jumble of disparate servers, storage and networking components that inhibit efficiency and flexibility. Accordingly, IT administrators and business unit managers alike are seeking simplified, flexible and efficient solutions that enable — rather than hinder — business success while boosting worker productivity and customer satisfaction. 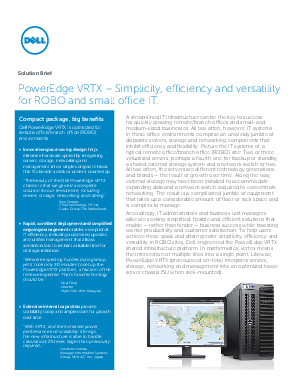 To help users achieve these goals and attain greater simplicity, efficiency and versatility in ROBO sites, Dell engineered the PowerEdge VRTX shared infrastructure platform. Download this white paper to learn more about Dell PowerEdge VRTX.